Toyota Fleet offers a complete range of services and finance packaged cars, along with a comprehensive range of vehicles – everything you need to help keep your business on the road. When you partner with Toyota Fleet, you’re backed by the advanced engineering, innovation and dedicated customer support. As a Toyota Fleet customer, you also have access to a wide range of support and services including finance and fleet management solutions, capped price servicing and the comprehensive Toyota New Vehicle Warranty. Whatever size car fleet you run, whole-of-life costs really matter. And as you know, the total cost of fleet ownership includes a great deal more than the initial financing of your cars. For whole-of-life costs, you also have to factor in servicing and repairs, fuel, resale value, and more. Our commitment to our fleet customers doesn’t end when they take delivery of their cars. With after-sales service that’s second to none, advanced engine technology delivering excellent fuel economy, and Toyota’s renowned resale value, you’ll continue to save money over the life of your fleet. Fuel can be one of the biggest expenses when running a fleet. With Toyota’s range of fuel-efficient engines and our world-leading hybrid technology, you could achieve outstanding fuel economy for your fleet [G1]. Toyota’s legendary engineering keeps maintenance costs low. Our cars are designed to be easily maintained and serviced quickly, keeping downtime to a minimum. With Toyota Service Advantage, you pay the same low capped price from one logbook service to the next, for a minimum of three years or 60,000km [T1], whichever comes first. Resale value – Thanks to our commitment to Quality, Durability and Reliability, there’s a good chance you’ll be pleasantly surprised by how well your Toyota’s maintain their resale value when it comes time to upgrade your fleet. 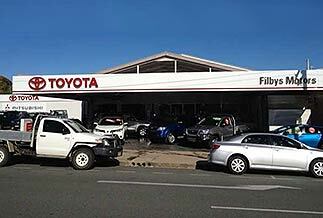 To minimise your whole-of-life costs, partnering with Toyota Fleet simply makes good business sense. Check out our fleet range or contact us to request a test drive or discuss your needs. [T1] Maximum payable for standard scheduled logbook servicing (normal operating conditions) until first of 3 years or 60,000kms, whichever occurs first (up to the first 6 services). Excludes Government & Rental vehicles. Contact your Toyota Dealer or go to toyota.com.au/advantage for other exclusions, eligibility and full details. [G1] Fuel consumption and emissions will vary depending on driving conditions/style, vehicle conditions and options/accessories. Source of fuel consumption data: ADR 81/02 combined cycle.